Investing just a little more money than with the Haugsvar mattress you could get IKEA’s Hesstung spring mattress and enjoy your sleep every night. This mattress, as well as all the mattresses from IKEA’s line, is designed and manufactured in Sweden. Therefore, the quality is guaranteed, no matter the cheap price. In IKEA’s case, a lower price does not mean lower quality because they tend to create the most affordable offers for their customers without compromising quality. In this review, we will break down the good and the bad sides of IKEA’s Hesstun spring mattress. The Hesstun mattress offers enhanced comfort and support, thanks to the double spring layer. Unlike the Haugsvar mattress, the Hesstun mattress has an additional layer of mini springs that provide twice as much comfort and resilience. 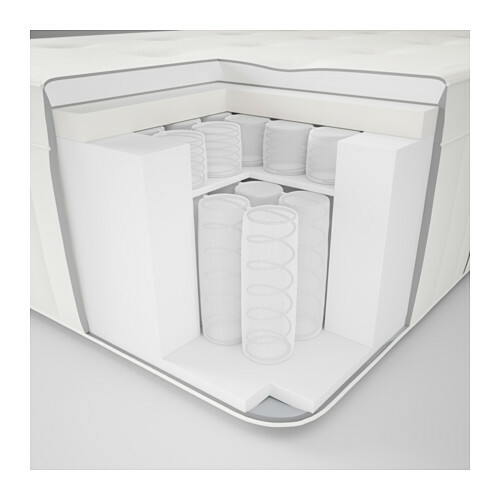 The mattress in queen size has 594 regular pocket springs and 594 mini pocket springs on top of the regular ones (in the queen size mattress). The spring layers are topped with two layers of foam, first one being cold foam of 1.8 PCF. The second foam layer is polyurethane foam of 1.7 PCF. 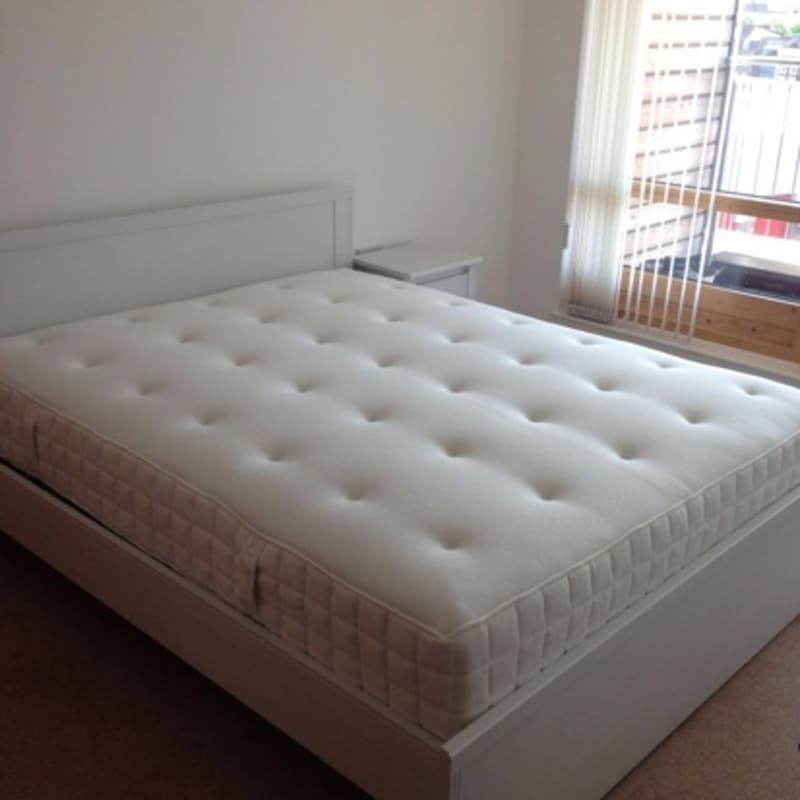 The mattress comes in typical four sizes; twin, full, king and queen size. Depending on the size, the number of pocket springs varies. The mattress consists of four layers that make it 32 cm thick. The regular as well as the mini pocket springs are made of high quality steel and are very responsive to your movement. The two remaining layers are made of polyurethane foam and cold foam, making the perfect combination for comfort and support. The Hesstun IKEA spring mattress is available as firm or medium firm, depending on your personal preference. The highly resilient foam layer on top of the springs allows for good pressure relief in your body. The mini pocket springs are designed to follow the contours of your body and form a firmer surface, thus enhancing the overall comfort of the mattress. The additional filling adds comfort, as well as the stretch material on the surface of the mattress that allows the springs to follow your movement accurately. According to customers’ opinions, the Hesstun spring mattress is a great solution for side sleepers because it offers just the right combination of firmness and softness. Even though this mattress has a high rating on the IKEA store, there have been some negative comments, complaining about how saggy the mattress is. Some customers have experienced the mattress getting dents in the spots where they were resting most of the time. After we analyzed all customers’ ratings and comments about the product, we have concluded that the mattress may not hold up heavier weight. Some consumers commented that the mattress is too soft and heavy for a heavier person. The Hesstun mattress is designed for use on one side only, meaning turning it over is not recommended. Another thing customers have found inconvenient is that the Hesstun mattress, unlike most of the other IKEA mattresses, doesn’t come roll packed. That means transporting it will be a struggle, especially getting it into the house and to the bedroom. Besides a few flaws such as the packaging and the weight limitations, there were no other negative comments or complaints about this mattress. Most people like and enjoy sleeping on it as their everyday bed setup. Speaking of bed setups, what goes best with the Hesstun spring mattress are the Espevar slatted mattress base for bed frame, the Luroy slatted bed base and the Kungsmynta mattress protector. With this IKEA mattress base and bed base, the Hesstun mattress will be a complete relaxation heaven for you, any time you go to sleep. The mattress protector is optional, depending whether you want to preserve the mattress for a longer period of time. Off-gassing will naturally be happening for a few weeks until the mattress airs out. Letting it air out in open space for a few hours per day is highly recommended. Motion transfer is not an issue since the coils are individually wrapped and thus insulate movement very well, allowing you to turn without waking up your partner. The cold foam layer on top keeps the temperature neutral so the mattress does not get too hot nor too cold, which significantly improves the overall sleep experience. Although it is slightly more expensive than some of the spring mattresses in IKEA’s line, the Hesstun spring mattress offers great quality and value that’s worth investing in. Even at the slight higher price, this mattress is still one of the best options for the money because there are so many overpriced products on the market. As mentioned earlier, the Hesstun spring mattress does not come roll packed. Now, that might be a problem if you were planning to transport it in your car. Transporting it in a van would be possible but it would still be a hassle, since the mattress is quite heavy and thus difficult to carry around. In both cases, the packaging presents a big inconvenience but it can be solved by signing up for IKEA’s shipping service. The service will, however, cost you some extra dollars but it will be well worth it to save yourself time and struggle with such a large mattress on your hands. IKEA offers a 25 year warranty on their mattresses as well as a one year trial period. The warranty covers all manufacturing defaults while any damage done by the consumer will not be covered. During the generous trial period, you can return the mattress in exchange for any other IKEA mattress. To do so, your mattress must be clean and undamaged. Exchange for money is not available. 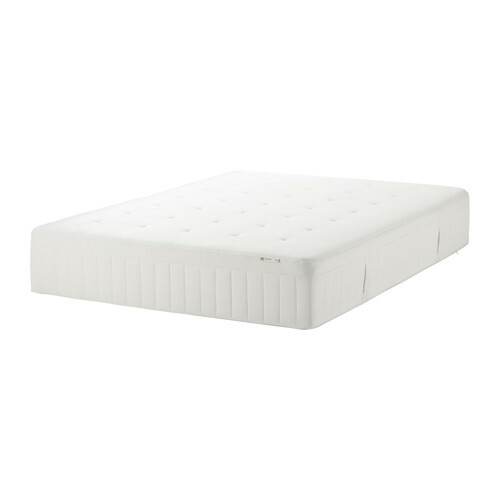 Is IKEA Hesstun Spring Mattress Good? All together, the Hesstun IKEA spring mattress is a great choice as long as it meets all your requirements. Keep in mind the weight limitations to prevent any unwanted situations. This spring mattress will give you exactly what you’re looking for, if you’re looking for comfort, support and a good night’s sleep. The Hesstun IKEA spring mattress is a great choice as long as it meets all your requirements. Keep in mind the weight limitations to prevent any unwanted situations. This spring mattress will give you exactly what you’re looking for, if you’re looking for comfort, support and a good night’s sleep. MyIKEABedroom.com is a participant of the Amazon Services LLC Associates Program, an affiliate advertising program – it is designed to provide an aid for the websites in earning an advertisement fee – by means of advertising and linking to Amazon.com products.